Ahhhh, September. The air turns crisper and temperatures start cooling down, but remain perfectly pleasant. It’s a great month to get outside in the mountains of North Carolina! And it’s excellent for bird watching because the changing seasons mean different and interesting birds are migrating through, on their way to their winter destinations. 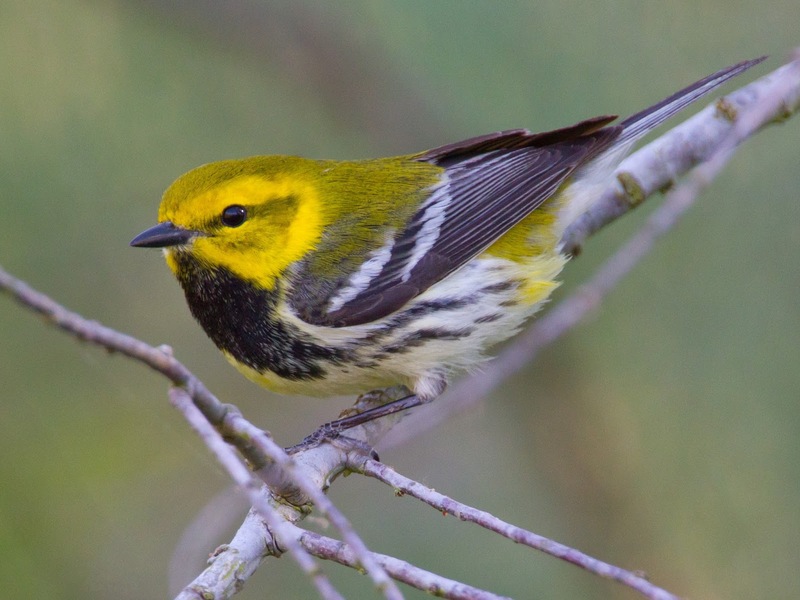 One such bird is our September 2015 pick for our 12 Months of Birding at the Inn series on the blog: the Black-throated Green Warbler. Even though it’s a small-ish bird — around 4.5 inches long — its unmistakable black throat and bright yellow head makes the Black-throated Green Warbler fairly easy to spot during both spring and fall migration here at the Inn on Mill Creek B&B. Typically, they are seen in the mornings near the Pool Garden or in tree branches along the edge of Pisgah National Forest near the apple orchard, looking for insects. During the summer, you may even see them here at the Inn. However, the Black-throated Green Warbler tends to be more visible in the summertime at elevations above 2,500 feet — along the Blue Ridge Parkway north of the Inn, for example (the Inn on Mill Creek is at 2,300 feet). We recommend looking for them in the area between Asheville and Craggy Gardens, where you’ll see the woods transition from birches and maples to spruce pines and fraser firs as the elevation climbs from 2,500 to 5,500 feet. In the fall, the Black-throated Green Warbler will start heading south to Central America, the Caribbean and northern parts of South America — that’s when they’ll go from higher elevations in a southerly direction through our “neighborhood” in the woods. So if you’re here in September, chances are likely that you’ll see this little sunny-faced bird perched on a branch or fluttering through the garden at the Inn on Mill Creek B&B inside Pisgah National Forest. This entry was posted in Birding in the North Carolina Mountains, Wildlife and tagged 12 Months of Birding at the Inn, birding, Blue Ridge Parkway by Inn on Mill Creek. Bookmark the permalink.